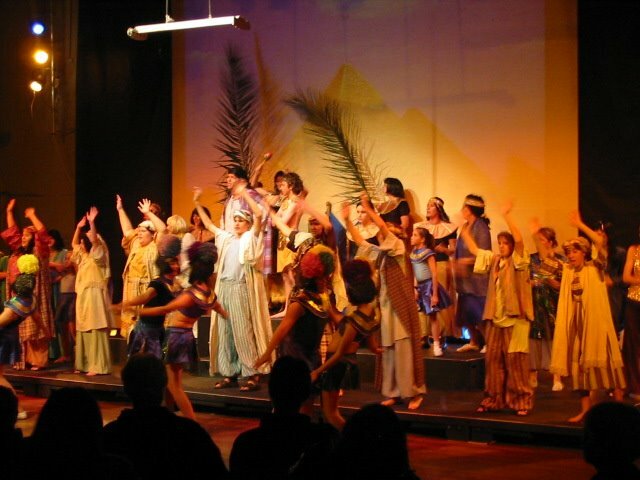 I went to the preview performance last night of our local production of Joseph which Jessica’s in. It was terrific! It was very bright, energetic, colourful, funny and full of life. The kids were great, they really knew their stuff and worked hard! Jessica’s been coming home from rehearsals worn out but happy. Our theatre group always produces shows of a high standard. The lighting and visual effects were good too. A data projector was used to project scenes on a backdrop instead of painted scenery which needs to be changed for each set. Now we’ve got eight more performances. We did Jesus Christ Superstar two years ago and the hall was packed out each performance, one of the Sunday matinees more chairs had to be brought in. I should think this will be the same. I’ll be helping with makeup for a number of the performances and I’ll attend another performance as a spectator too!